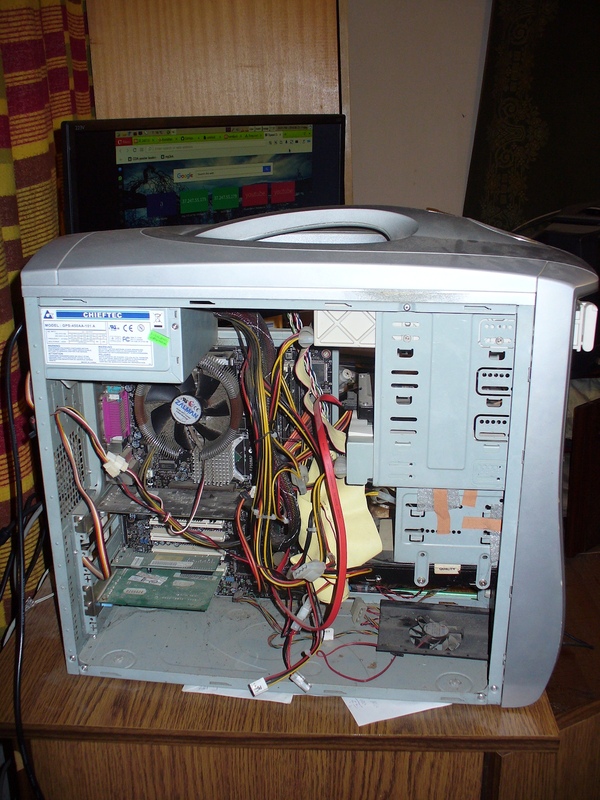 I have a 16 years old computer: Intel D865PERL mainboard, 2 GB RAM, 2.4 GHz hyperthread CPU, Geforce MX440 64 MB (4x AGP), 21.5" Philips LCD W-LED display. My PC was usable for everyday tasks, web browsing, programming, avisynth, etc, but sometimes was a bit slowish, especially web browsing with Firefox or Pale Moon. Opera was OK.
Now I managed to setup a more optimized /etc/X11/xorg.conf file, and the visual performance has been greatly improved: "glxgears" becnhmarks shows FPS rates from previous xorg.conf 4 FPS increased to 500 FPS. However I don't run OpenGL games, nor other 3D applications, except Google Earth. Animations on websites became more smooth, even flash ads looks better, not to mention youtube videos, now they play smoothly. Option "metamodes" "CRT-0: 1024x768_75 +0+0"
Happy experimenting with the settings! [    82.360] (==) Using config file: "/etc/X11/xorg.conf"
[    82.382] (==) Using config directory: "/etc/X11/xorg.conf.d"
[    82.446] (==) ServerLayout "Layout0"
[    82.446] (**) |   |-->Monitor "Monitor0"
[    82.447] (**) |   |-->Device "Videocard0"
[    82.447] (**) |-->Input Device "Keyboard0"
[    82.447] (**) |-->Input Device "Mouse0"
[    82.447] (**) Option "Xinerama" "0"
[    82.447] (**) Option "AIGLX" "on"
[    82.555] (**) ModulePath set to "/usr/lib/xorg/modules/extensions/nvidia,/usr/lib/xorg/modules/drivers,/usr/lib/xorg/modules"
[    82.555] (WW) Hotplugging is on, devices using drivers 'kbd', 'mouse' or 'vmmouse' will be disabled. [    82.558] (II) "extmod" will be loaded. This was enabled by default and also specified in the config file. [    82.558] (II) "dbe" will be loaded. This was enabled by default and also specified in the config file. [    82.558] (II) "glx" will be loaded. This was enabled by default and also specified in the config file. [    82.558] (II) "record" will be loaded by default. [    82.558] (II) "dri" will be loaded by default. [    82.558] (II) "dri2" will be loaded by default. [    82.558] (II) LoadModule: "dbe"
[    82.640] (II) Module dbe: vendor="X.Org Foundation"
[    82.640] (II) LoadModule: "extmod"
[    82.652] (II) Module extmod: vendor="X.Org Foundation"
[    82.653] (II) LoadModule: "glx"
[    83.048] (II) Module glx: vendor="NVIDIA Corporation"
[    83.048] (II) LoadModule: "record"
[    83.070] (II) Module record: vendor="X.Org Foundation"
[    83.070] (II) LoadModule: "dri"
[    83.091] (II) Module dri: vendor="X.Org Foundation"
[    83.091] (II) LoadModule: "dri2"
[    83.093] (II) Module dri2: vendor="X.Org Foundation"
[    83.093] (II) LoadModule: "nvidia"
[    83.152] (II) Module nvidia: vendor="NVIDIA Corporation"
[    83.184] (II) Loading sub module "fb"
[    83.184] (II) LoadModule: "fb"
[    83.193] (II) Module fb: vendor="X.Org Foundation"
[    83.193] (II) Loading sub module "ramdac"
[    83.194] (II) LoadModule: "ramdac"
[    83.214] (**) NVIDIA(0): Option "RenderAccel" "true"
[    83.214] (**) NVIDIA(0): Option "MetaModes" "CRT-0: 1024x768_75 +0+0"
[    83.215] (**) NVIDIA(0): Option "AddARGBGLXVisuals" "True"
[    83.215] (**) NVIDIA(0): Option "DisableGLXRootClipping" "True"
[    83.968] (II) NVIDIA(0):     "CRT-0:1024x768_75+0+0"
[    83.968] (WW) NVIDIA(0): 32-bit ARGB GLX visuals require the Composite extension. [    83.968] (II) NVIDIA(0): Disabling 32-bit ARGB GLX visuals. [    83.969] (II) NVIDIA(0): Initialized GART. [    84.112] (II) NVIDIA(0): Setting mode "CRT-0:1024x768_75+0+0"
[    85.130] (**) Power Button: Applying InputClass "system-keyboard"
[    85.130] (**) Power Button: Applying InputClass "Keyboard-layout"
[    85.130] (**) Power Button: Applying InputClass "evdev keyboard catchall"
[    85.130] (II) LoadModule: "evdev"
[    85.149] (II) Module evdev: vendor="X.Org Foundation"
[    85.149] (**) evdev: Power Button: Device: "/dev/input/event4"
[    85.149] (**) Option "config_info" "udev:/sys/devices/LNXSYSTM:00/LNXPWRBN:00/input/input5/event4"
[    85.149] (**) Option "xkb_rules" "evdev"
[    85.149] (**) Option "xkb_model" "pc105"
[    85.149] (**) Option "xkb_layout" "hu"
[    85.149] (**) Option "xkb_options" "terminate:ctrl_alt_bksp"
[    85.273] (**) Sleep Button: Applying InputClass "system-keyboard"
[    85.273] (**) Sleep Button: Applying InputClass "Keyboard-layout"
[    85.273] (**) Sleep Button: Applying InputClass "evdev keyboard catchall"
[    85.273] (**) evdev: Sleep Button: Device: "/dev/input/event3"
[    85.273] (**) Option "config_info" "udev:/sys/devices/LNXSYSTM:00/LNXSYBUS:00/PNP0C0E:00/input/input2/event3"
[    85.273] (**) Option "xkb_rules" "evdev"
[    85.273] (**) Option "xkb_model" "pc105"
[    85.273] (**) Option "xkb_layout" "hu"
[    85.273] (**) Option "xkb_options" "terminate:ctrl_alt_bksp"
[    85.275] (**) AT Translated Set 2 keyboard: Applying InputClass "system-keyboard"
[    85.275] (**) AT Translated Set 2 keyboard: Applying InputClass "Keyboard-layout"
[    85.275] (**) AT Translated Set 2 keyboard: Applying InputClass "evdev keyboard catchall"
[    85.275] (**) evdev: AT Translated Set 2 keyboard: Device: "/dev/input/event0"
[    85.275] (**) Option "config_info" "udev:/sys/devices/platform/i8042/serio0/input/input0/event0"
[    85.275] (**) Option "xkb_rules" "evdev"
[    85.275] (**) Option "xkb_model" "pc105"
[    85.275] (**) Option "xkb_layout" "hu"
[    85.275] (**) Option "xkb_options" "terminate:ctrl_alt_bksp"
[    85.280] (**) ImPS/2 Generic Wheel Mouse: Applying InputClass "evdev pointer catchall"
[    85.280] (**) evdev: ImPS/2 Generic Wheel Mouse: Device: "/dev/input/event2"
[    85.280] (**) Option "config_info" "udev:/sys/devices/platform/i8042/serio1/input/input3/event2"
[    85.281] (II) evdev: ImPS/2 Generic Wheel Mouse: initialized for relative axes. [    85.282] (II) No input driver specified, ignoring this device. [    85.282] (II) This device may have been added with another device file. [   156.284] (II) NVIDIA(0): Setting mode "1024x768_60"
[   764.898] Warning: Xalloc: requesting unpleasantly large amount of memory: 0 bytes. [   792.977] Warning: Xalloc: requesting unpleasantly large amount of memory: 0 bytes. [   838.704] Warning: Xalloc: requesting unpleasantly large amount of memory: 0 bytes. Do you have a picture of the machine? One can spot an ancient Maxtor 80 MB (!) hard disk on the first picture from 1992. I simply used it as some kind of "keel", ballast to reduce chassis vibration caused by a previous IDE hard drive. I also applied plastic foam pieces with medical tape for the same reason. Nowadays I can achieve the same effect with "hdparm" utility and hard disk drive noise management... After the highly vibrating and noisy IDE hard disk died, I simply put my new Western Digital Blue 7200 RPM, 500 GB SATA hard disk on the top of my IDE DVD burner without using any screws, onto a folded newspaper, to reduce vibration. We can see the passively cooled AGP video card, Geforce MX440. I had previously a passive FX5200 too, but unfortunately it abruptly died without any particular reason. I also have a Sound Blaster 16 and a minimalistic network card connected to the motherboard PCI channels. 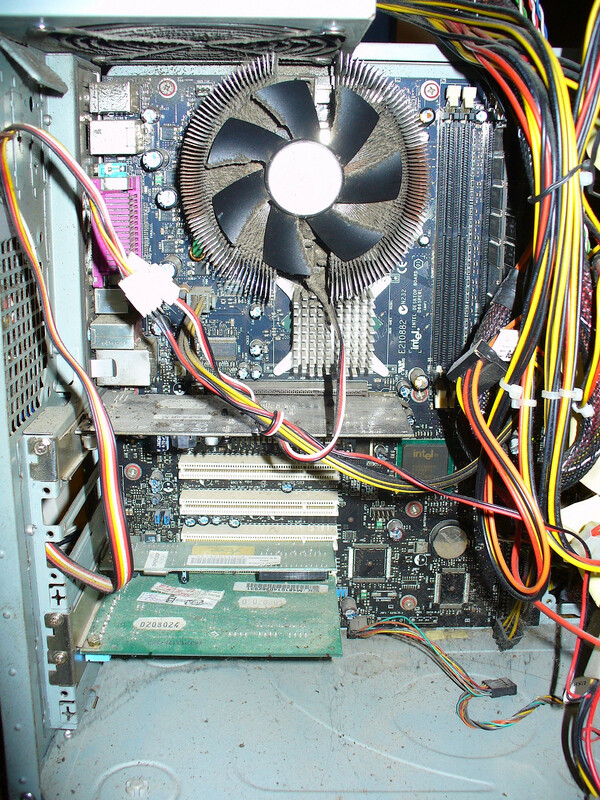 However there are integrated network card and sound card on the motherboard too. I use them when needed as spare parts in case of failure. The adjustable Zalman cooler always works on the lowest spin rate, I never adjust the regulator which is tied with some wire onto the rear of the chassis. Sometimes I use an ordinary paintbrush together with the vacuum cleaner to get rid of the laying dust. The chassis has a handhold on the top, I choosed this chassis when I bought the computer in 2002 exactly for this reason: to be able more easily to carry home by bus and train. Since then everything was replaced or upgraded except the chassis, the mobo and the CPU. This is my main computer, as I have an even older one: KOB KT266a FDSX mainboard, 2 GB RAM @ 133 Mhz, AMD Athlon XP 1800, 80 GB Maxtor HDD, I use it only as a spare machine in case of failure. However I am unable to use a decent web browser on the older machine due to the lack of SSE2 instruction set of the AMD Athlon. How it is possible use the controller 96.43.23 with xorg-server 1.20? I use a GeForce4 mx 4000. Xorg is currently at version 1.20. I doubt that any of the current Nvidia driver packages is able to drive them. (disclaimer: I don't have any Nvidia card, so I cannot test).